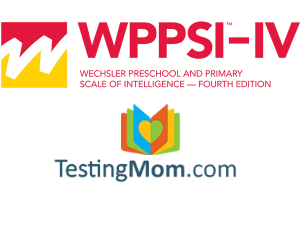 The WPPSI (Wechsler Preschool and Primary Scale of Intelligence) uses subtests to determine a child’s Verbal and Performance IQ scores as well as the processing speed for children ages 2.5 years old to 7.25 years old. The WPPSI uses composite scores to assess a student’s general intellectual ability and cognitive functioning based on their test performance and current age. The test typically takes less than an hour and is given one-on-one by a trained psychologist. The WPPSI-IV is often required by private schools and some gifted and talented programs or schools as part of the application screening and admissions process; it is administered by the Education Records Bureau (ERB). The WPPSI-IV can also be used to identify cognitive delays, learning disabilities and be combined with other tests to assess each child’s level of intellectual giftedness. To get started with all of the WPPSI testing material offered by Testing Mom, check out our 100 Free Questions. Could you tell me who I can contact to have my son to do the WPPSI™-IV in New York City? I need him to do this test urgently as it is requested for a school application in France. Could you tell me who I can contact to have my son to do the WPPSI™-IV in Japan or Hawaii? The WPPSI is administered by a Psychologist and it would depend on the Psychologist’s skill set or training if they were qualified to test a child with special needs and what test would be used. We cannot verify or deny this test would be suitable in this scenario as it would be the responsibility of the Psychologist to confirm this based on their abilities. Hi, could you advise where to the WPPSI test in Germany or if it’s possible to complete the test online? We live in Germany and we will move to New Jersey this summer after our son finishes his 1st Garde in German. Our first language is German and our son understand some English as he is in a German / English bilingual school.